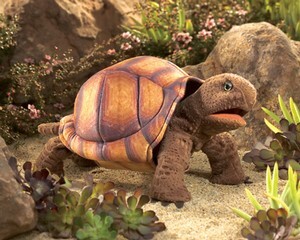 Folkmanis 2976 - He may be the last one to the party, but the DESERT TORTOISE PUPPET holds the secret to longevity. With life-like coloration, the patterned fabric shell is just one step away from nature. Your friends will be delighted when your tortoise comes to life as you articulate the movable mouth and legs, then retract them into his shell. Measures 15” long, 9” wide, 6.5” tall. Movable mouth and forelegs, tucks into shell.